Growing up in Detroit in the nineteen-eighties, Carl Craig was relieved of the burden to invent. D.j.s like his mentor, Derrick May, had already hatched techno, leaving the teen-ager to toy with its lofty limits. 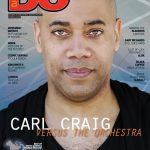 Since 1991, when Craig released his first EP, “4 Jazz Funk Classics,” he has rethought the cavernous 808 drums of his city’s sound; his 2013 record “Masterpiece” included sparse, ambient tracks inspired by David Lynch. On March 11, Craig’s “Detroit Love” party returns; as is underground custom, coördinates will be announced the day of.